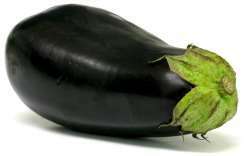 This Eggplant recipes page contains info about eggplants and different ways to cook them. These recipes are easy to make. Eggplant is also known as aubergine or brinjal. Eggplants come in lovely purple color as well as light green color. Some purple ones are also streaked with white. The large purple eggplants contain less seeds. There was a time when I didn't like the skins of eggplants though I loved the insides. I got over my dislike of skins over the time.I am sure there are many people like me who don't like the skin. 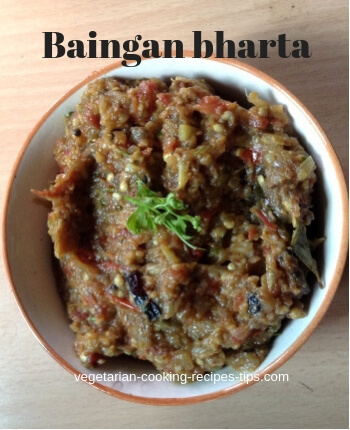 You will like recipes like baigan bharta and baigan ka bharta recipe where we use roasted and skin removed eggplant. From the nutritional point, the skin has nasunin, a very good antioxidant for you. It is mainly present in the purple eggplants shown in the left image. So choose the purple eggplants whenever you can. And when you use them, do not throw away the skin. Deep Frying, stir frying, roasting , grilling, baking etc. It depends on what you are making with them as well as which variety you are using. The large purple eggplants are good for roasting and grilling. I find the long green ones good for using by cutting them first and then shallow frying or deep frying and then using to make eggplant fry or eggplant biryani. Eggplants can also be combined with other vegetables such as potatoes,tomatoes, onions and made into a delicious curry. They are also good with lentils too. I am sure you will enjoy the recipes given below. 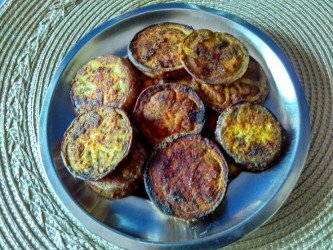 Roasting eggplant on gas / open flame to make baingan bharta or a eggplant dip. Serve with rice or roti, chapati, bhakri. A Karnataka recipe. 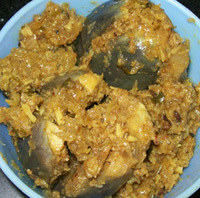 Baigan Bharta - Vangyache Bharit - Roasted eggplant salad. 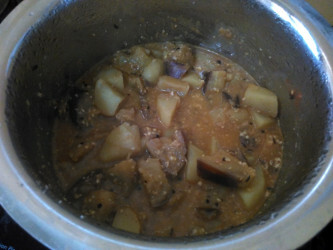 Eggplant potato subji - Aloo baingan subji.